update: In the past week the news about a further decline in the birthrate created quite a discussion in the German media which took me by surprise. For some reason the critical barrier which made people take notice was births slipping under the 700.000 mark. Actually this isn´t remarkable nor shocking, at least for anyone who has followed the matter for a few years. The population projections have predicted this trend for years and it is mentioned in countless reports and papers by many institutions, demographers, analysts and researchers. The real issue that I was trying to point out in my original post was net immigration. Since 2001 this has been steadily dropping to about 90-80.000. This is odd for a number of reasons if you start to look closer at the figures. I´ve compiled this graph at the top with immigration and emigration figures from the Statistisches Bundesamt for the period 1950-2004. My focus is on the period after 1990. 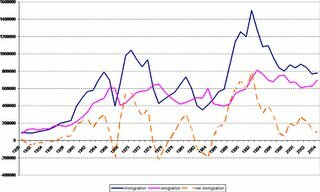 After the the fall of the Berlin wall, German immigration jumped to record levels (1,5 mil in 1992) mainly due to a influx from migrants from eastern Europe. After 1992 the number of immigrants slowly dropped. 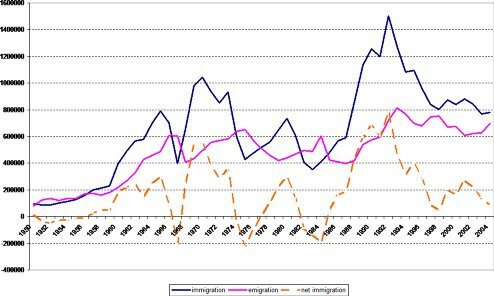 Since 1995 the numbers of immigrants continues to hover around 900-750.000 yet since 2003 the net inflow has dropped to 90-80.000. Why is this happening? Right now I can only give the first part of the answer : emigration. More and people are emigrating and if this trend continues Germany might become an emigrant country (at least for a short run before immigration picks up again). This aspect, that countries that face population decline might also see an increase in emigration is something I´ve never seen mentioned as a credible option in theory before. Yet the numbers are telling a different story. The 2nd part is why people are emigrating: Is it due to the economic downturn? Immigrants moving on or returning home? What are the factors for this increase? I´ll be looking deeper into this in another post. In the meantime I welcome comments on this issue. Germany´s net migration stays low. Bundesamt has published its official population prognosis for 2005. The German population will decline slightly from 82,5 mil to 82,45 mil in 2005. Aprox. 820-830.000 people died in 2005 , slightly up from 818.000 in 2004. The main cause in 2005 for the drop was a further decline in births, from 706.000 in 2004 down to 680-690.000 in 2005. Net migration into Germany continues to stay low with aprox. 80-90.000 people compared with 83.000 in 2004. In itself it´s curious that German net migration is so low because Eurostat reports that EU wide net migration is on the increase after a dip during the mid 1990´s. This will be the third year in a row Germany experienced a decline. The last time Germany experienced a decline was in 1998. Back then it was also due to a large drop in net migration. Thanks for that quote, you´ve given me another piece of the puzzle. Thanks for this Jim. The perspective is interesting. I have long been thinking that we might see some trend like this, with winners and losers. It's a kind of butterfly economics situation, as those who get traction get still more traction, and those who get stuck get even more stuck. I hadn't thought of Austria in this light before. Certainly the Czech republic case is interesting, and contrasts sharply with what is happening in terms of growth in Portugal (which could in some ways be considered to be comparable, except that it is in the euro). Small states seem to have an advantage, since they have to look outwards, and really they have no option but to reform in the longer term. Big losers at the moment look to be the bigger states like Germany, Italy and Poland, and smaller ones whose dynamic is so negative that it is hard to change course (Bulgaria). Anyway, plase keep us informed of anything else like this that you see. Who said blogs served no purpose :). "I have read articles myself on that topic recently. Be careful with that piece of information: The numbers might be true - more Germans on the Austrian labor market than Turkish people. But I don't think there are more people of German origin working here. They only count the passports I assume. Germans usually don't want to have the Austrian passport. Turkish immigrants though do. Once they have it, they count as Austrians. Which they then of course are - but you know what I mean. I don't think a significant number of Germans will move to the Czech Republic to work there in the near future. Germans don't learn and don't speak Czech. Maybe a few of them (those who maybe had Russian in East German schools and/or live close to the border) will give it a try, but not a big number. The language problem will be a big one. Especially since Czech is so horribly difficult. The thing that initially struck me about the story (which is why I remembered it when I read captyk's post) wasn't that Germans were migrating. Rather it was that labour mobility in the EU is terribly hampered by language. Here are East Germans (alright, Germans from the Eastern Lander) who can't get jobs in their native region, want, therefore, to find work elsewhere in the EU, and where do they go? Austria. In the towns in Czechia near former East Germany border, Germans are taking jobs because they are unemployed and dread the dehumanizing 1-Euro Jobs. They live in Germany but travel daily to Czech Rep. I've seen in German TV a reportage about a family with three almost grown kids, whose 40-45-year old father got a job in Sweden. Formerly, he worked in construction (foreman or so), then he had a small enterprise about building doors, windows and floors, which failed. Now he landed a construction job in Sweden, working on their wooden houses. The whole family except the oldest son is selling their house and moving there. All Germans I speak about are ethnic Germans, no Turks.